Day two of Living Below the Line. It's kind of funny, because lentils, barley, millet, and soy figure prominently in my usual vegan diet. It also comprises the base of the diets of many of the world's poorest populations. Curious about what the rest of the world eats? 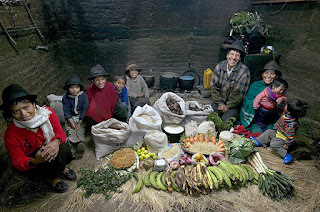 Well, photographer Peter Menzel and writer Faith d'Aluisio published a photographic essay on the matter, documenting the week's meals for families around the globe. The stark contrasts between the photographs speak not only to cultural differences, but also regional income differences. 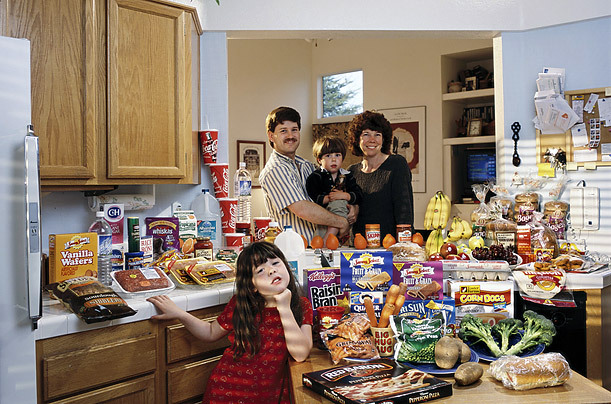 Hungry Planet, which came out in 2005, aimed to demonstrate how globalization and migration have affected diets all around the world. What I took home from the book, was the spectrum of household larder compositions - from boxed cereals to fresh-picked vegetables. In Ecuador, a family of nine subsist off of $31.55 per week, growing much of their own food. Bananas, carrots, and potatoes complement larger quantities of grains. A family of six in a refugee camp in Chad spend $1.23 per week on food., but largely receive rations from the World Food Programme. Sorghum, corn-soy blend, and legumes like beans, peas, lentils, chickpeas, and fava beans make up the bulk, with small amounts of dried peppers, tomatoes, okra, and meats thrown into the mix. While this closely mirrors my week's eating, it also struck my that all of their water (not just for drinking) comes from Oxfam International. Now, I am not arguing that the majority of the population should return to subsistence farming, or consume only the staple foods off of which many in developing countries survive. However, the prominence of these calorie dense grains and legumes, as well as the nutrient dense fresh produce in middle and some low income countries struck me (was drawn to India and Guatemala's photos). Perhaps we need to take some lessons from the low prevalence of highly processed and packaged foods in these diets. Check out the TIME Magazine galleries for more photos: part I, part II, and newer book What I Eat.